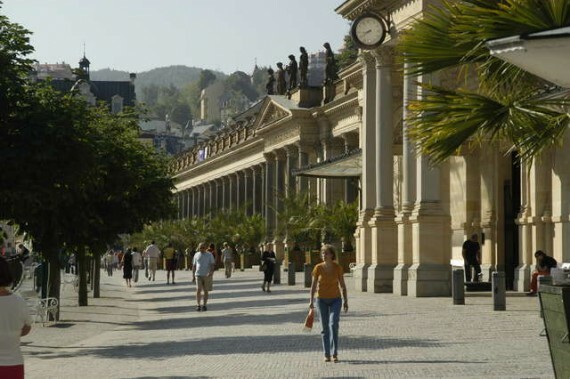 Everywhere on the Internet you will read how breathtaking the Spa town of Karlovy Vary (Carlsbad) is and how it’s often referred to as The Monte Carlo of Czech Republic. I will skip its history and I am going to show you in colour how we managed to have a great weekend away there with our demolition squad: 2 and 3 year old boys. Someone once told me that children will adjust to different situations as often as their parents challenge them so. You can either A) go everywhere where your children want to go or B) your children go everywhere where you want to go. We belong to group B. This is sometimes not easily done because our youngest can be a difficult one. Regardless of our difficulties we still try to go to places we love no matter what. There is so much worth going to see in Karlovy Vary. I have been going there every year for the past 15 years and have never been bored yet. Lately, I love it even more since my favourite actor Daniel Craig filmed his first James Bond movie Casino Royal at the famous Hotel PUPP which dominates the end of promenade. So now whenever I miss the town I watch the movie. 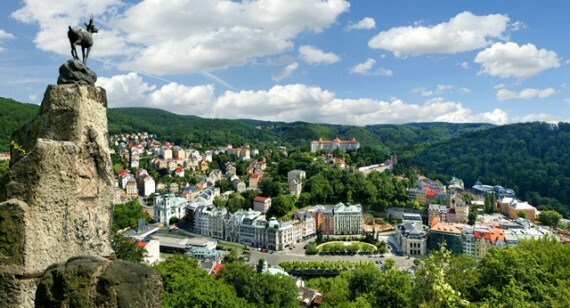 Karlovy Vary has many hotels but not all of them are suitable for young families, especially if your children can be noisy. Many hotels cater for pensioners and no matter how nice the Grannys might look, they might not appreciate your treasure having a tantrum right outside their room or being disturbed at breakfast. So I contacted the Info Office of Karlovy Vary to give me tips on good family hotels with patient hotel personnel. As it turned out the Information Office also operate as a Travel Agent and are able to search and book you hotels with swimming pool and family rooms right in the Spa Centre. Having worked in the hotel business I decided to go online and find directly our preferred hotel. What a great choice!!!! The Humboldt Park Hotel gets my full recommendation. The hotel was lovely and the service was always with a smile and patience (even when the boys starting riding the baggage trolley through the Lobby or kept on switching on the shoe brush over and over again). It has a great Wellness and Spa Centre within and the food was awesome. The boys were unleashed in the swimming pool and jacuzzi and we swapped turns in the Sauna. We enjoyed every second of our stay and so did our boys and we never had the feeling that we were “bothering” anyone with child related requests. This for sure helped our relaxation which is what we had come for. I should probably get some commission from them for this free advertisement! The Spa Promenade begins with the Hotel Thermal (an ugly, tall, dark, communist era building which does not match the style of any of the other hotels and restaurants in the area) and ends in front of the famous Hotel Pupp. 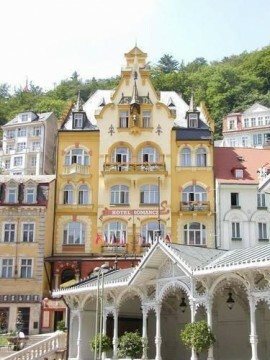 Karlovy Vary’s 12 springs are rich in sodium, bicarbonate and sulphates. The different springs are very similar to each other as far as chemical composition is concerned but come out of the ground at different temperatures and contain differing amounts of CO2. Common practise is to take a drinking cup and walk from one spring to another sipping the hot waters and enjoying the Spa mood. Here I have to mention one piece of practical advice. You might want to know the location of the public toilets before you take the Spring journey….just in case. One of them is located opposite the Hotel Thermal and another one I know of is in the main Spring Hall called Vridlo. This is a big glass building with the largest and hottest spring in Karlovy Vary. It rises to the surface with respectable energy. The Thermal Spring can spurt up to 12m, thus discharging 2000 litres of hot water and 5000 litres of carbon dioxide from the underground every minute. 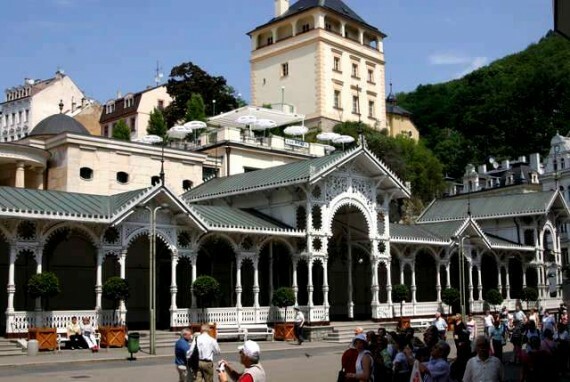 You might get tempted by the Cafe and Sweet Shop within with marvelous views of the Old Colonnade and the heart of Karlovy Vary. You will never forget the Mill Colonnade once you’ve see it. 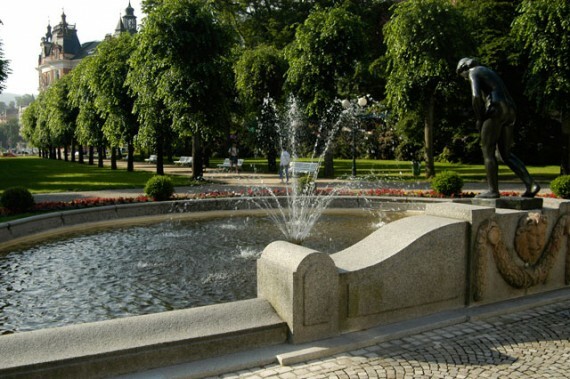 Many movies have been filmed there and it is a similar monument in Karlovy Vary as the Trevis Fountain is to Rome. The boys played hide-and-seek in between its columns, meanwhile I was inhaling the atmosphere. It is like moving back in time. The clock stops ticking, there is no rush, no stress, while the charm of history surrounds you. You can buy special Porcelain Sippy Cups (cups designed to drink the Spring water from) everywhere in Karlovy Vary in many different designs, some of them made especially for children. The prices can vary by as much as 40 CZK at different stands and shops, with an average price of 100 CZK. Nicolas’ cup lasted exactly 16 minutes. He smacked it against the Spring water and 140 CZK was gone. Shame they don’t sell any plastic ones but that would be a sin in a town with its rich porcelain history. After a great time with the boys in the hotel`s Wellness centre where we enjoyed swimming, using the sauna and sitting in the whirlpools, we left our boys already asleep with a babysitter. Prior to our arrival we have made sure that our hotel offered this possibility. Apparently they work with a reliable agency providing professional babysitters. Of course we were a bit hesitant and were ready to dismiss her in case we felt a slightest doubt in her ability. She turned out to be nice and professional and all went well. This gave us the opportunity to discover the famous “Becher’s Bar” in the Hotel Pupp where we had a great evening out dancing. Your kids will definitely appreciate the cable car. It has two stops and you will get a chance to see the city from a different, unforgettable perspective looking down into the Spa Valley. 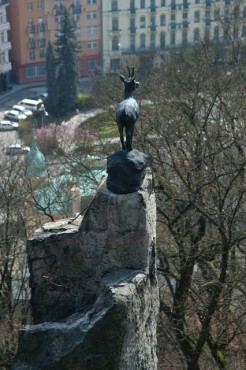 The statue of a Chamois standing on a rock, his eyes set on the city belongs to Karlovy Vary as much as the mineral water, spa wafers and Becher liqueur. The Becher liqueur or ‘Becherovka’ has saved me a few times from stomach problems on trips and many of my foreign friends discovered how soothing can it be after meals. It is quite strong so watch out and don’t just “knock it down”. It needs to be sipped and tasted. You will have a chance to appreciate it in every Czech restaurant or bar. It is very popular not only as a “shot” but as well as a long drink when combined with Schweps Tonic. This long drink is called “BETON” (BEcherovka + TOnic) - which translates as “concrete” in Czech. It was first produced by Josef Becher at his chemist shop in 1807. First, he sold it in vials as gastric drops. The growing popularity of the drink went hand in hand with the increasing size of the flasks in which the liqueur was decanted under its original name „Carlsbader English Bitter“. Approximately seventy years after the creation of the formula Becherovka began to be filled in typical flat bottles. 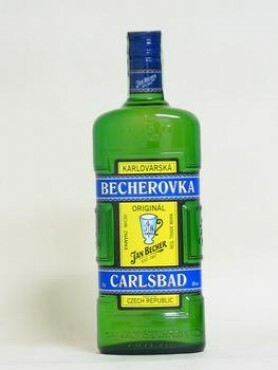 The Czech name Becherovka has been officially used since the foundation of Czechoslovakia in 1918. For more than 200 years, the very production of the liqueur has been shrouded with mystery. The exact ratio of ingredients was handed from father to son as a family secret. Today, the Becherovka formula is known only to two people who prepare a special mixture of spices and herbs once a week. Becherovka is so inherently connected with Karlovy Vary that has its own Jan Becher Museum. The Dear Jump Circuit can be reached by the cable car which leaves near The Hotel Pupp and the trip can be managed comfortably with a pram. Get off at Deer Jump Station or you ride further uphill to the Diana Outlook Tower and walk back some 500m. You will pass a sanatorium called Myslivna (Gamekeeper’s Lodge), followed by a restaurant named U Myslivny (Gamekeeper’s Lodge) and finally by restaurant called Jelení Skok (Deer Jump). From there you can walk downhill on a serpentine path to the statue of the Chamois and farther below the Deer Jump Belvedere. Do not be confused by the identical name of the three places. You will know you have reached the right spot when you can see the Chamois statue. From the statue you can keep on walking down the steps and then take a path that sways to the right back to the Hotel Pupp. The path is provided with tourist marks, direction indicators and orientation maps. A lot has been written about the city being overtaken by Russian citizens and their businesses and as a Czech citizen I sadly agree with this fact. As I’m still within my country I would like to see more Czech influence rather then a foreign one. Be prepared to see Russian oriented shops, signes and menus written in the Cyrillic alphabet, it can all be a bit confusing at times. On the last day we took the boys to a small pond close to the Hotel Thermal to feed the ducks as do so many other people there. I am surprised the ducks still manage to stay afloat with all the food given to them daily. See how it looks in November and imagine how beautiful it might be in Spring and Summer. As a pro-active mother and the trip organiser I managed to find an Indoor Playground 2 minutes away from our hotel. It was after several discussions with locals that we were eventually able to find this place that was not mentioned anywhere on the Internet. The play area is found in the shopping centre Perla. If you walk up the street from the main Post Office, you will find it on the right. If the escalator happens to be closed please use the lift which will get you there. Additional Suggestions: if your children are older and can ride bikes, the bike ride out of the Spa Centre next to the Tepla River is unforgettable. You can rent bikes in every hotel. Families that play Golf will really enjoy one of the most famous Golf courses in the Czech Republic, especially when partaking in their special Kids Programmes. The Golf Course is 18-holes in beautiful natural surroundings and is the oldest golf club in Bohemia. It also offers a golf hall equipped with simulators, tennis courts, indoor and outdoor swimming pools, snooker, bowling and riding facilities, a modern shooting range, skateboarding, karate, football and squash. DIRECTIONS By Car: from Prague (the distance is 127 km) head towards Ruzyne Airport and take the E48/A6 to Karlovy Vary. You can take a break in the village of Krusovice which is mid-point of the 127km trip. The restaurant U LIpy in Krusovice is a nice choice for lunch or dinner. By Bus: from Ruzyne Airport Terminal 1 you can catch a luxury coach operated by Student Agency. The trip takes 105 minutes and costs 120 CZK per adult. You can buy tickets online here.